Did you get a last minute invitation to a 4th of July event? Or perhaps, you have been procrastinating all weekend on finding the perfect, comfortable outfit to wear. Do not worry; you still have time for creating a last minute 4th of July outfit. Under most circumstances, you may already have the accessories in your closet. If not, with a little creativity, last minute deals or a quick trip to a local dollar store is all you may need. BBQ, an evening bonfire, fireworks or hanging out with friends, the 4th of July should be a memorable occasion. Worrying how you look should be the last thing on your mind. Pick out some comfortable clothing and have fun. Life is short. Celebrate it. Picking out red, white and blue clothing to mix and match is the perfect 4th of July outfit. For example, a red t-shirt, blue jean cut-off shorts, and a white bandana is the perfect, easy combination. Or you can simply get a little creative. Paint a T-Shirt: Grab a white t-shirt. Using fabric paint, add patriotic sayings to the shirt. “God Bless the USA” or a simply “Happy 4th of July” instantly transforms your shirt. Get creative, along with sayings; add stars, the US flag and more. Customize a T-Shirt: Many local department stores have 4th of July themed t-shirts for minimal costs. In order to stand out in the crowd, customize your shirt. For example, cutting fringe around the sleeves or bottom of the t-shirt will make yours stand out from others with the same one. Add Beads: If you decide to add fringe to your t-shirt, consider adding beads too. Pony beads have a large opening to pass the fabric through with ease. Securely tying red, white or blue Pony beads to the end of the fringe is the perfect addition. Pony beads are an inexpensive accessory. Grab the Sharpies: Coming in a broad spectrum of colors, permanent Sharpie Markers are fantastic. For added fun with your 4th of July t-shirt, grab a couple of your favorite colors. Ask friends or family members to sign your shirt. At the end of the evening, the shirt full of signatures instantly becomes a memorable keepsake. More Beads: Pony beads make excellent necklaces, bracelets, and ankle bracelets. The large colors will stand out bold on a sunny 4th of July day. Ribbon: Grab some red, white or blue ribbon out of your craft box. If you are wearing your hair up, consider a braid or two. Intertwine the patriotic colors through the braid for extra flare. Scarves and Bandanas: Inexpensive scarves or bandanas from your local dollar store are the perfect accessories for your outfit. 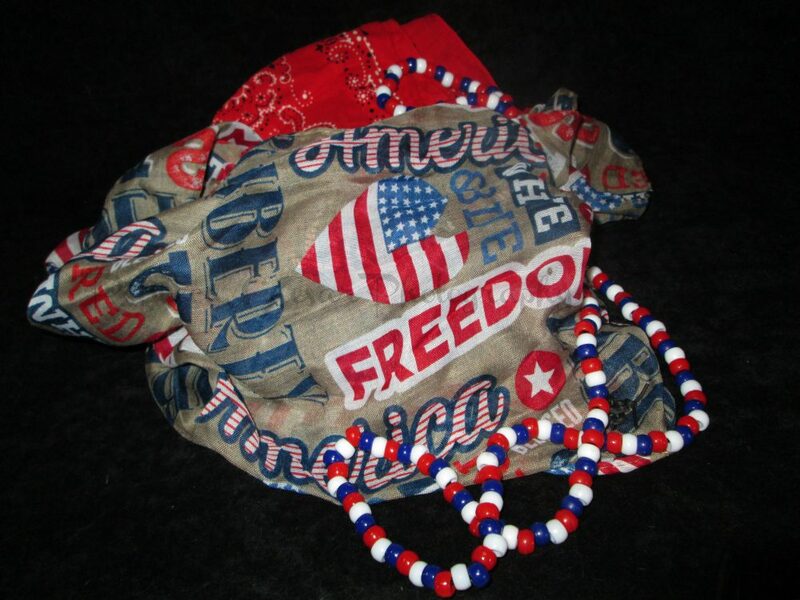 Wearing a patriotic scarf around your neck or pulling your hair back with a bandana, helps complete your outfit. When creating your 4th of July outfit, have fun. The outfit is about you. Allow your individual personality to shine brightly on this patriotic holiday.